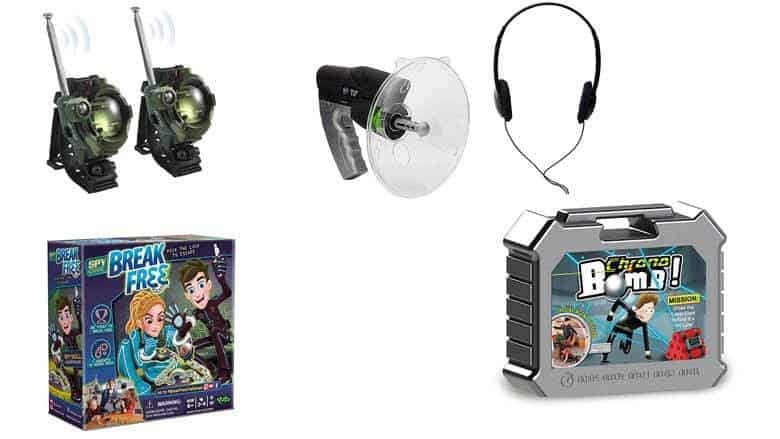 The best spy gear toys for kids come in different forms. From secret features in watches to night vision goggles, kids can have their choice when it comes to being the next 007 agents. Since the spy world fascinates kids, it can also be one of the best times to teach kids more about technology. Many of the toys which kids use to play spy games with actually derivate from actual professional products. 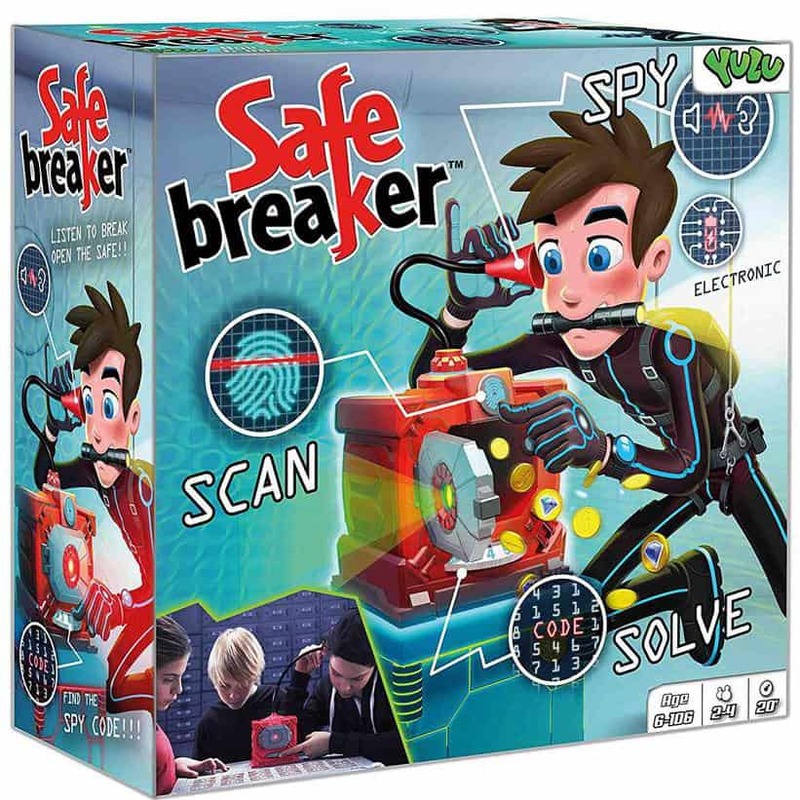 But before becoming the next agent exchanging secret documents in a remote location, parents can consider one of the following spy gear toys for their kids. Why we like it: What would actual spies do without proper communication? Kids can use the walkie talkies to receive or inform. The walkie talkies might be made for kids, but they come with reliable performance up to 160 feet. Made from durable materials, they work both for voice and video communication. The best part is that video communication is not predicated on WiFi connectivity. As a result, kids can see each other while communicating. Included headphones also make the walkie talkies a real tool for spies wishing to remain undetected. 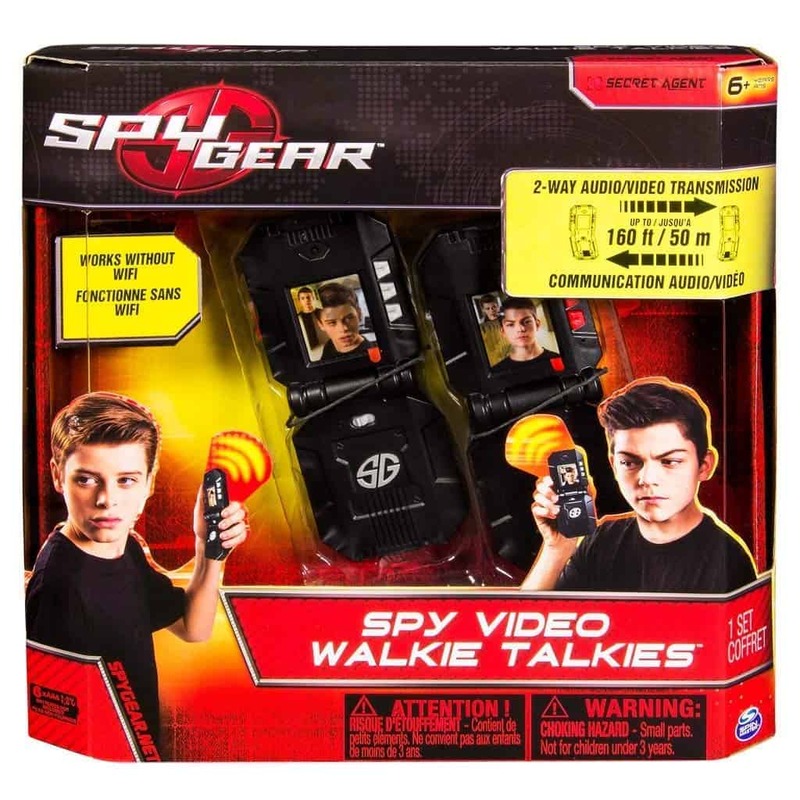 Along the same low profile lines, kids can use the walkie talkies for remote surveillance with their built-in hidden cameras. Why we like it: Exploring surroundings without being seen is a must for good spies. This versatile design allows kids to remain undetected. With an intriguing design, the Spy Snake Came is true to its name. Having the ability to be one of the simplest and most effective tools when it comes to its flexible neck can go far. Hiding behind a corner and even hiding behind a sofa should not be a problem as a result. The greatest feature of the camera is that it transmits images from the top of the neck to the actual LCD screen which sits in the palm of the spy. Based on AAA batteries, the camera can work for longer periods of time ensuring spies remain undetected in their location. Why we like it: Inspired by NOV8 from the Netflix Original Series, the kit is a must-have in a spies’ makeup bag. The kit comes packed with spy gear toys for kids. So even objects which look familiar are not truly what they seem at first sight. For example, what looks like a perfume bottle is actually a secret message launcher. But the spy kit also comes with fingerprint dust powder. A fake air blower, as well as a fake lipstick, is also added to the kit. Up to 20 objects can be found in the Spy Bag. With the help of an included flashlight, these objects can be used during the night as well. Why we like it: All great spies have capable wrist watches which can sometimes offer extra functionalities. 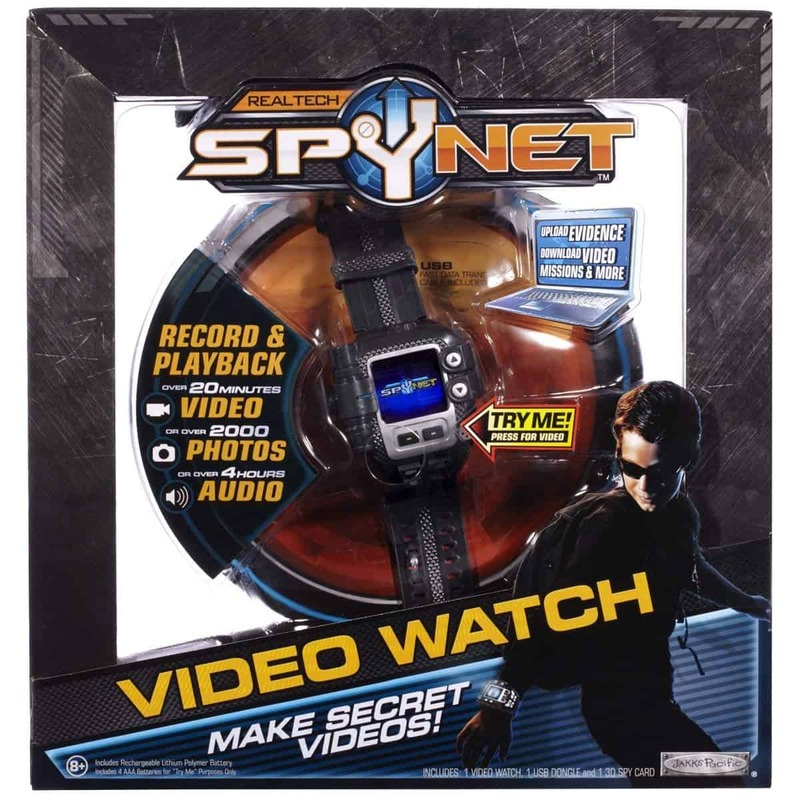 Spy Net’s wrist watch is one of the must-have spy gear toys for kids. Of course, it shows the time just as any other watch. But it also comes with recording capacities which a spy can use to gather proof. The watch can record audio and video. It can also snap quick photos for the evidence files. Up to 2.000 photos can be taken with the watch and up to 20 minutes of video recording can be saved on its internal memory. The watch even comes with advanced functions such as the capacity to protect all the files with a fail-safe button to keep its internal memory from deleting evidence. Charging the watch is easy and transferring the recorded photos is made via a regular USB cable to any PC. Why we like it: The goggles are made to offer nighttime and daytime surveillance with advanced spy features. Made with a design which favors spying activity, the goggles are easy to use. Most importantly, they come with features every modern spy can rely on. Up to 15 meters, it provides impressive quality in enemy or target surveillance. With dedicated daytime functions, it is ready for action in any situation. With the help of thermal vision, it detects targets even when they are difficult to spot with the bare eye. This function can detect targets up to 50’ away during the night as well. A ghostly target lock mode is featured in the goggles as well. But the interesting part is those future spies can record these images by videos or by photos as they collect evidence. 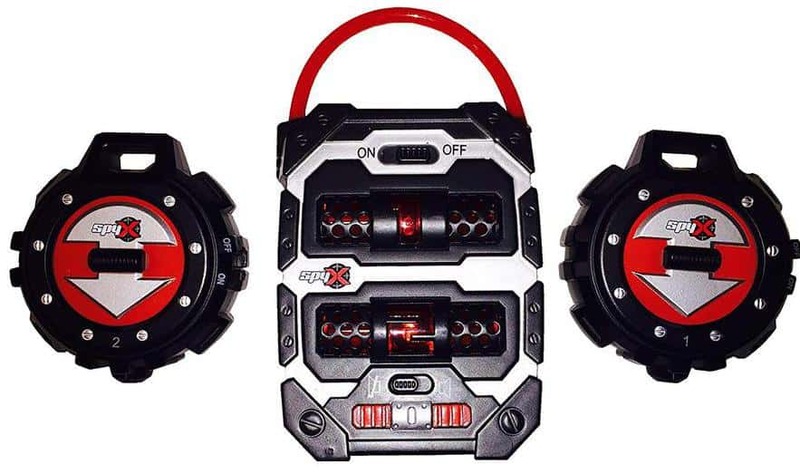 Powered by 4 AA batteries, this spy gear essential can work for hours while kids gather enough information to solve their next case. All data can then be saved in the internal microSD memory card to add to the evidence files. 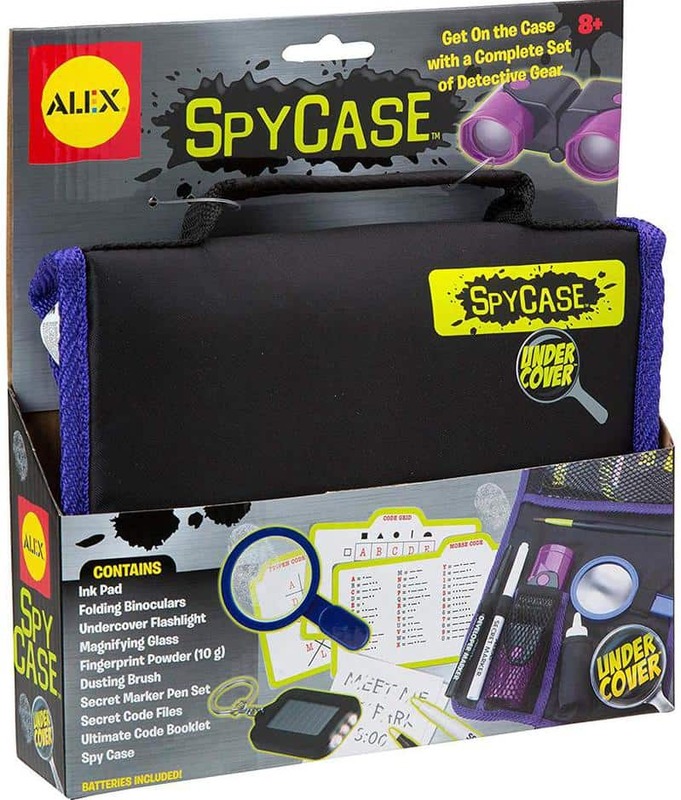 Why we like it: As an all-in-one spy detective set, kids can consider it to plan their next case in detail. This award-winning spy set can spark a child’s imagination and it can serve as a planning tool for the best results for kids who like to stay organized. It comes with an ink pad, binoculars, a flashlight, a magnifying glass, a marker pen set, and fingerprint powder. This spy gear can be used on surveillance and on target identification. All collected information can then be written down on the code files’ booklet. As with any spy kit, not all gear has to be used in every case. It is why kids can plan their own spying cases and the gear they want to use. Since all of the gear is quite small and made to be hard to detect, kids can also carry their kits with them while away from home. Why we like it: Solving the next case can sometimes demand that a spy is able to bypass a safe’s security lock. This unique spy gear safe toy is both fun and educational. As it comes with voice guidance, it gives kids tips towards solving the next step of cracking the safe. For example, it teaches kids how to count as it gives an indication that the next number on the lock needs to be higher or lower. The great part is that kids can practice their basic math skills as well. The safe is not quick to unlock. It actually takes a few hours to bypass its lock. For this reason, kids can set their own standards when it comes to the pace in which they want to bypass the safe. If they are playing with friends, they can have more fun and they can learn social skills better as well. Why we like it: How many spies can actually say that they use a tank for their surveillance video recording? 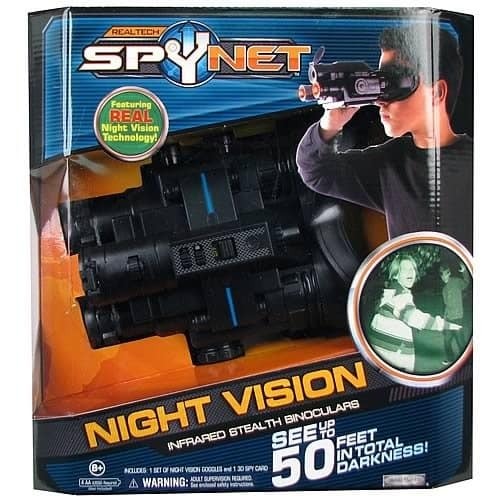 This original spy gear toy is one of the best solutions for those seeking the ultimate freedom and surveillance stealth. 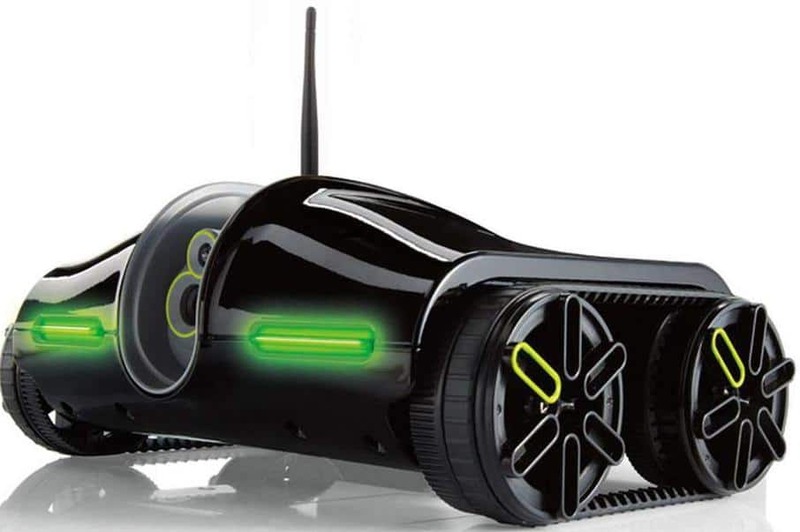 Made with a modern design, the tank is actually controlled from a tablet or smartphone. Using wireless connectivity, it can be controlled up to 200 feet when there are no obstructions to worry about and up to 100 feet when the tank travels around walls or other obstructions. The tank is packed with modern technologies. It comes with video recording capabilities. Furthermore, it can also work with live YouTube streaming showing the spy all that’s actually going on with the targets. The camera is highly capable and it comes with a wide angle to capture entire scenes and with infrared technologies to ensure nighttime recording is possible as well. Why we like it: A top spy is always dressed for purpose and the right outfit is only good when it doesn’t stand out. A costume set can be a top gift idea for future spies. It comes to teach kids more about how maintaining a low profile is crucial for spies. At the same time, it is one of the only ways in which kids can actually be credible spies to themselves. The set includes a black spy jacket, a cool hat, mirrored sunglasses, decoder lens, a spy handbook, and a secret code message card. Made for kids aged between 5 and 8, the set can work for both boys and girls. Each spy can role play or dress up for a themed party. Kids can also wear their cool spy outfit while out of the house. 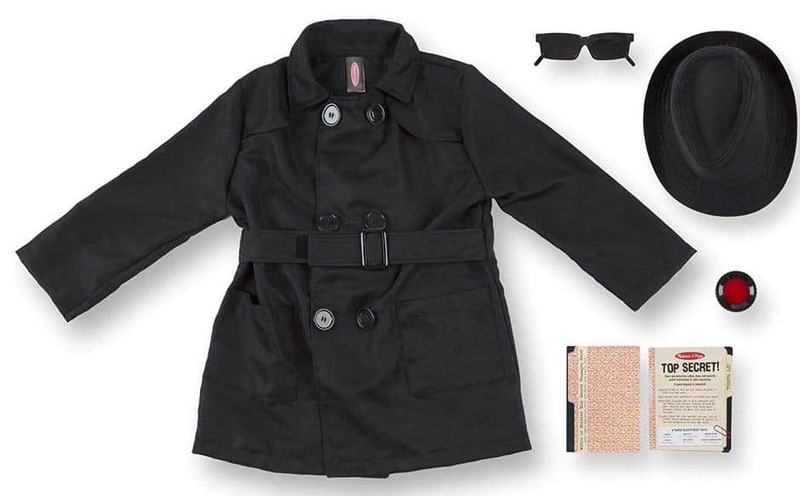 With a couple of pockets, their spy coat can hold their sunglasses and their spy handbook while inside. Parents will also be glad to know the costume set is durable as it can be washed with regular clothes. Why we like it: Spies are people of action. An action camera is a must for the modern fast-paced spy life. This action camera can be everything spies need when seeking to capture important images. Even if it’s just made as a toy, the action camera is fully functional. It can be worn on the head so that the camera sees what the spy sees. With an elastic band, the action camera is recommended for kids of all ages so that it can be passed down to future generations of spies as well. In terms of performance, the camera can take still pictures. It also has an included burst mode for the spies to ensure all frames are captured with fast-moving subjects. But the camera also records video files. It is why spies can record their own images and download them to a PC to check out for any potential clues in solving their case. Together with the camera, spies also receive a general mount accessory which ensures the camera can be placed anywhere. 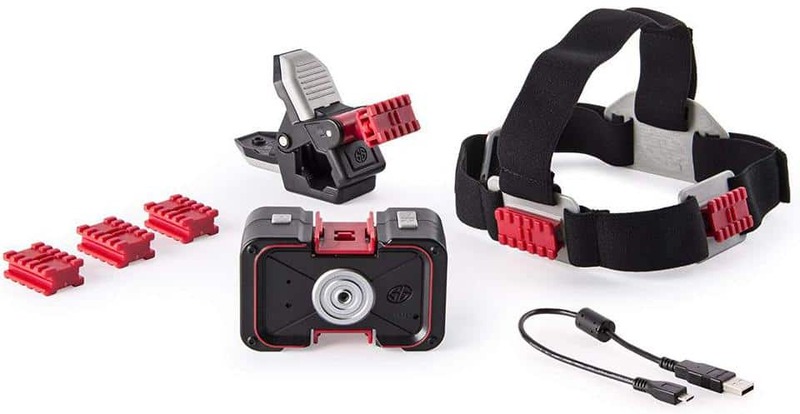 From fixing it on a bike to transforming it into a fixed camera around the house, the included accessories make it viable for any type of surveillance needs. Why we like it: A cool pen is always used by the next 007 agents and MaleDen offers a top perspective on these designs. 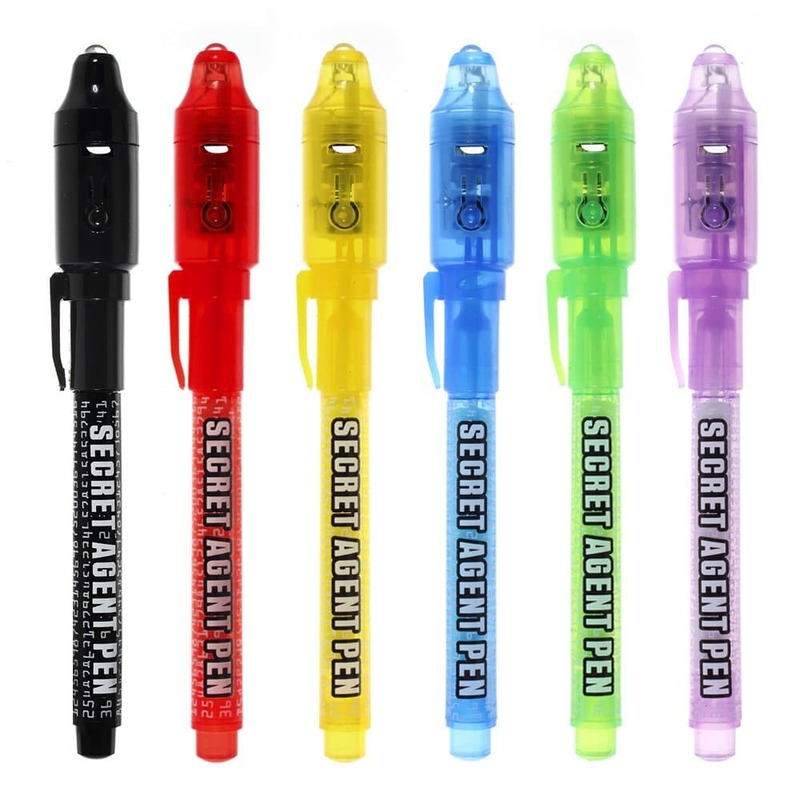 As their name suggests, invisible ink pens are found in all basic spy kits. Most kids will love the magic they come with. Simply put, the invisible ink can’t be seen with the naked eye. It’s only when kids use the cap’s UV light that they can see what is actually written. It means that kids can leave secret messages for their parents to discover without anyone from outside even knowing that there is writing on a piece of paper. Each pen comes with a distinct outside color. But spies know that under the UV light, all colors look the same. It is why they can even use multiple Invisible Ink pens mixed with regular pens. Only kids will know their special pens can actually be read under the UV light. Batteries for the caps’ light are included as well so that the little spies have everything they need for better spy success. Why we like it: Reaching that bomb in time to save the world is something all spies need to face at some point. Made with as a unique game idea, the set is perfect for endless hours of fun, even when kids play in groups. Of course, there are no real lasers to worry about. But kids have to make their way to the bomb without actually touching the strings. If the accidentally touch any of the strings, the bomb’s timer will countdown faster. 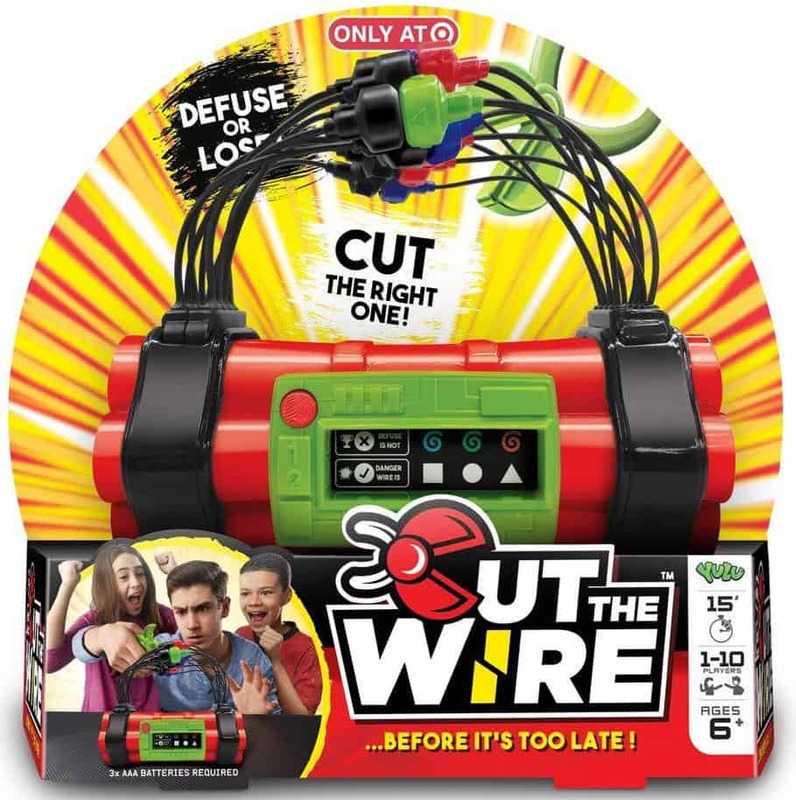 The bomb set comes with included accessories which allows the strings to be set up around the house. Practically, the game can be played in any room of the house. It allows kids to have a better understanding of what’s possible when they have some imagination. 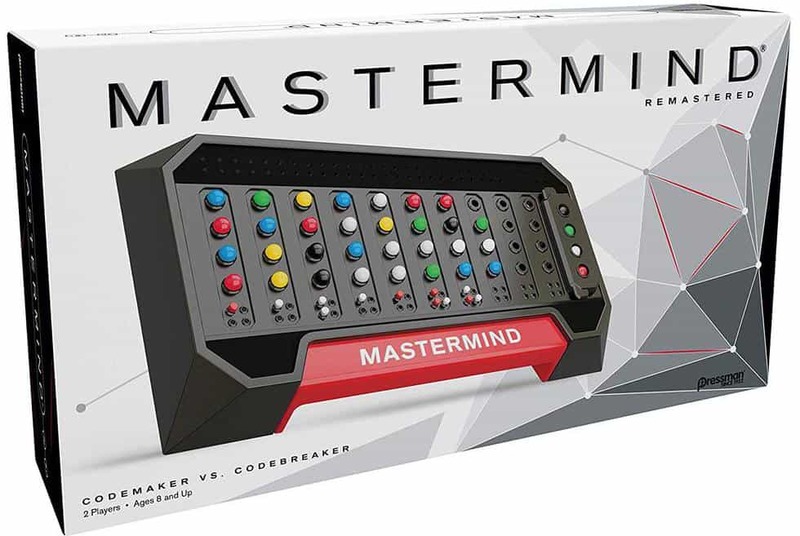 It also keeps the game interactive for a long period of time as it allows the strings to be installed at different angles to offer different challenges. 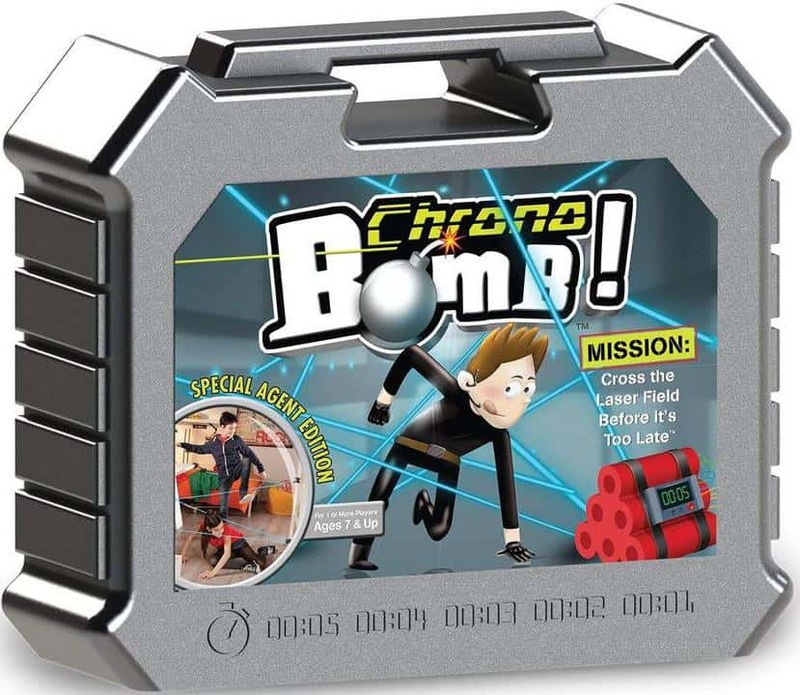 To play the game after the strings are installed, kids simply need to place the bomb at the opposing end of the start point and start the countdown timer before embarking on a real challenge for their developing spy and stealth skills. Why we like it: Becoming a true detective might take special gear. Everybody knows Batman’s night goggles are the best for finding clues. 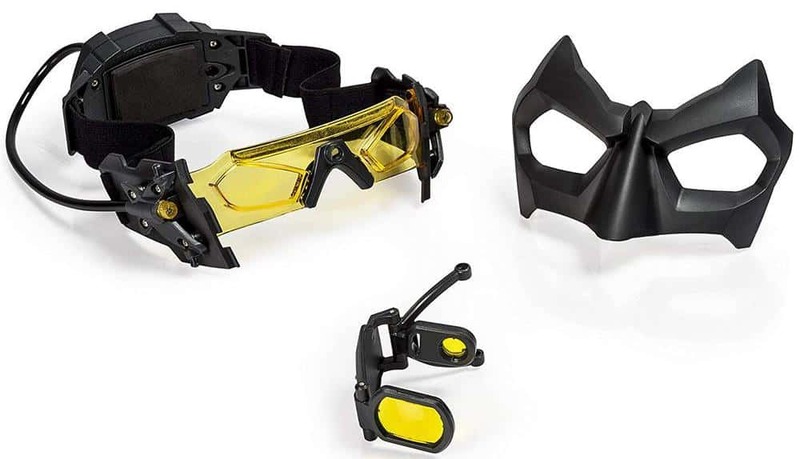 Inspired by the true Batman’s gear, the night goggles look spectacular. Kids immediately love them as they associate the goggles with the superhero. Exploring the surroundings during the night is easier as a result. To make their way around the house during the night, kids can use the included LED lights which will guide them towards their next clues. But even Batman can have a difficult time picking up smaller clues in low light situations. It is why Spy Gear added a retractable magnifying lens to the goggles. It comes with extra strength for reading small prints and secret messages. 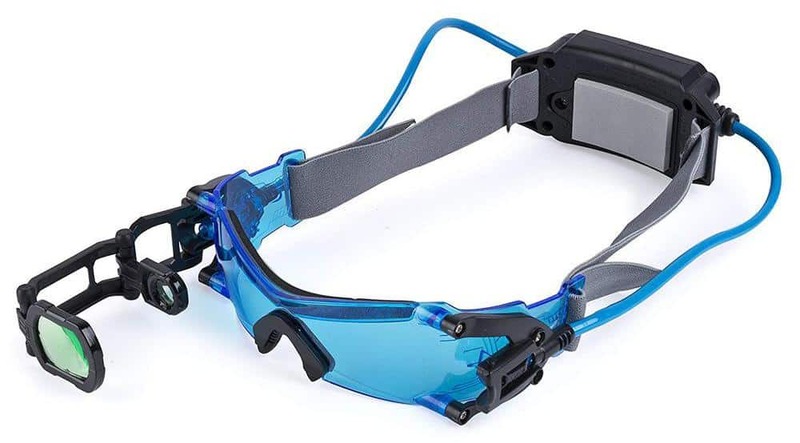 Powered by 3 AAA batteries, the goggles come with a night vision function allowing future detectives to keep looking for clues even where nobody else is able to do so. Why we like it: Capturing images from above is now a must-do for spies who take their jobs seriously. 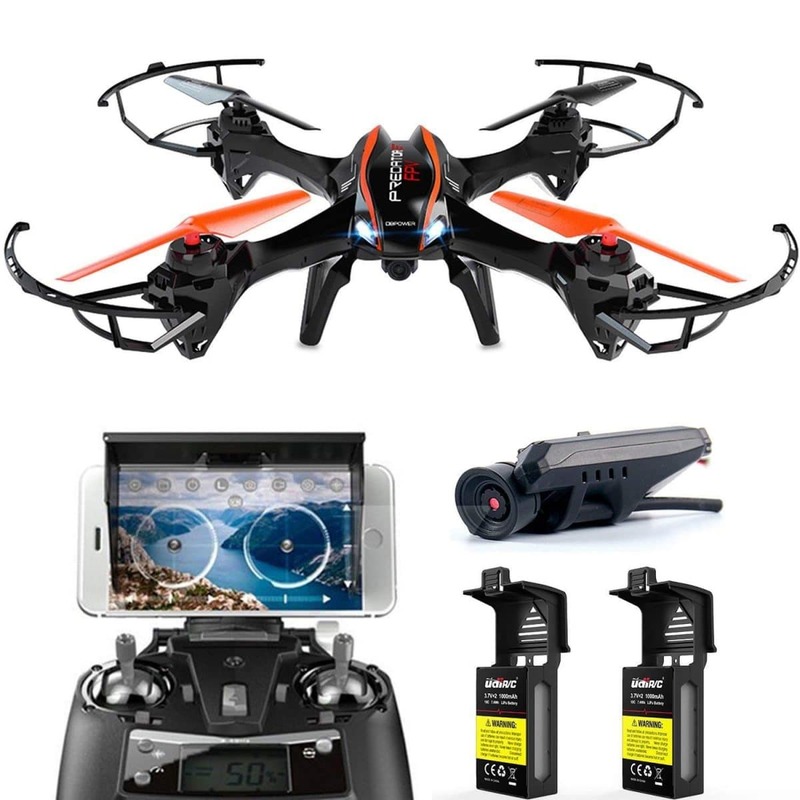 This Quadcopter Drone can be a top gift for kids who are familiar with gadgets and who want to take their spy games to the next level. Offered at an affordable price, the Quadcopter is a great learning drone which comes with plenty of functionalities to keep kids occupied during their time off from school. With smartphone compatibility, the drone captures images which are streamed to the phone. The controller is similar to what is seen in premium drones and it is also a good reason to use the Quadcopter before moving on to more expensive alternatives. Of course, the captured images are the most important. It is why the included camera offers 720p HD video recording. Made with a wide angle lens, the built-in camera is able to offer a better perspective on buildings or surroundings, making it a unique to for spies who want to go the extra mile. Why we like it: A good spy knows that navigating through the dark can be challenging without proper hand-mounted gadgets. This unique light offers kids the possibility to have their hands-free while also guiding them with sufficient light through dark rooms around the house. The hand-mounted light device can offer impressive guidance. It uses 4 LED tubes which make their way from the wrist to the tip of the fingers. At the same time, they can be adjusted so that the lighting looks different. As all spy know, diversion tactics are of high value. It is why the light device can be used to distract the attention of the enemy. In the dark, the enemy has no clue what the light actually is or where the spy is actually at. All lights can be controlled with an on and off switch. When keeping a low profile becomes crucial, the little spies can turn the light off to go under the enemy’s radar. Why we like it: As part of a spy’s training course, mastering a motion alarm has a lesson of its own. The Spy Gear’s Motion Alarm Toy is one of the most imaginative and fun gadgets future spies can play with. Made to protect valuables, important files or even secret codes, the alarm is easy to use. Most importantly, it keeps intruders away from valuables. Based on motion sensors, the alarm actually detects when ill-intentioned intruders are close to valuables. Sounding the alarm whenever danger is detected, the motion alarm can be a handy tool in a larger gear package aimed at training a new generation of spies. Recommended for ages 6 and up, the motion alarm is powered by 2 standard AAA batteries. The batteries need to be purchased separately. But since the motion alarm comes with a short learning curve, kids can learn to change the batteries on their own. Why we like it: Handcuffs can never stop a real spy from fighting the good fight and saving those in need. 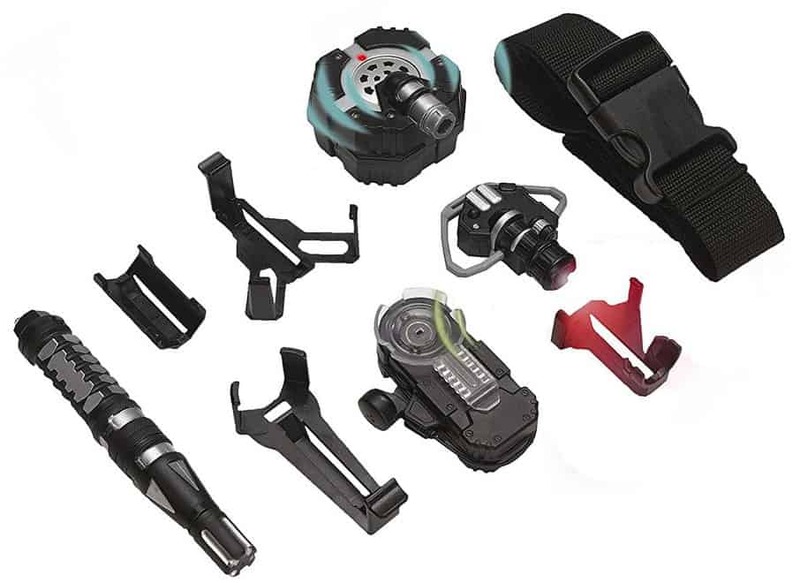 Based on 4 handcuffs, the set is recommended for one or multiple players. It is truly fun to use for real spies training with their friends. Kids can simply challenge themselves to see get free from the handcuffs first. Of course, getting out of handcuffs is not that easy. Each player has a personal challenge to go through. 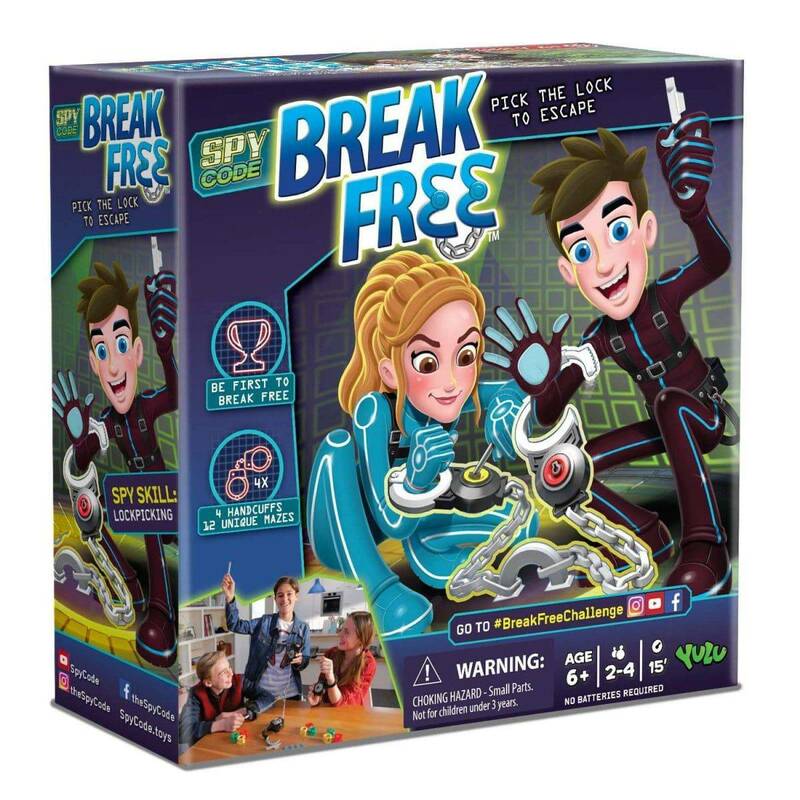 Combining the principle of many break-free games, the handcuffs put the spy’s patience to a test. They need to pick the lock the right way. With plenty of good energy and proper strategies, kids can find the shortest route towards freedom. The great news is that the game can be shared with friends or even with parents. Why we like it: A laser trap alarm is still the best active method of protecting a perimeter. The Lazer Trap Alarm comes as one of the top customizable spy gear toys kids can consider. Made to fulfill all protection needs, the alarm can be one of the top active solutions to keep spies and the valuables safe. 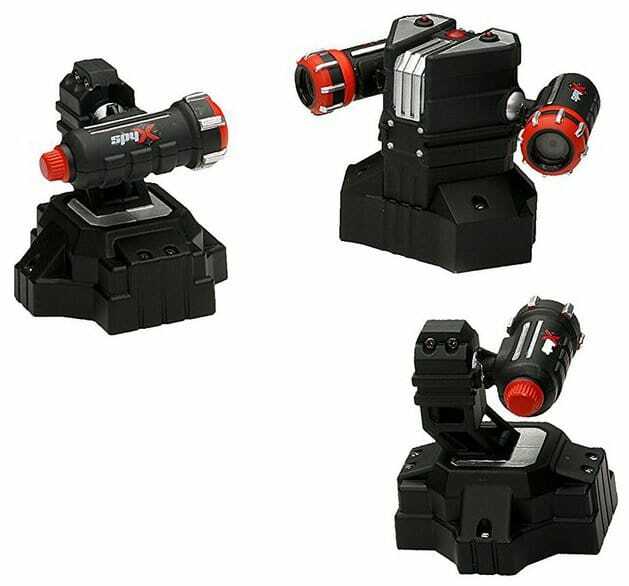 With 3 adjustable laser beam traps, kids can set up their own perimeters. When it comes to actual spying skills, kids can learn a few things about what protection perimeter looks like at its core. Of course, the laser beams are invisible. But when trespassed and when they are set at up to 4 feet apart, they sound the alarm. This alarm can come with audio beeping or it can come with visual flashes. Most importantly, the alarms allow multiple configuration options which can protect most rooms around the house. Why we like it: Voted as the spy product of the year, the set offers a proper start into a spying career. 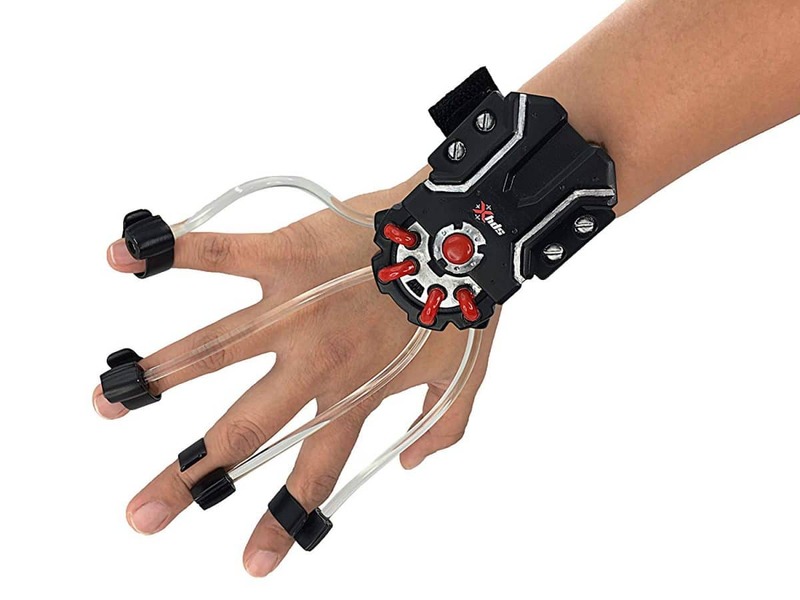 Shipped with a practical utility belt, the gear set is among the most respected spy gear toys for kids. As the best toy voted by actual users, it comes with proven results. Inside the kit, little spies will find a micro ear light, an invisible pen, a small motion alarm, and a micro listener. These tools can be used in low light conditions. They can be used to leave handwritten messages only visible under a UV light. The kit also includes a motion alarm which can protect all this gear. A micro listener can help future spies’ ear tuned to any suspicious activity around the house. The kit in itself is enough to start learning more about the secret lives of spies. Why we like it: With real night vision technology, the binoculars are used in many surveillance missions for intel gathering. All spies need proper binoculars. Spy Net’s binoculars are among the best options for those seeking real technologies. Kids can learn more about night vision and everything it comes with. For this purpose, the manufacturer also used the Eyeclops technology to make the binocular even more reliable. With a top performance up to 50 feet away, new spies can detect their suspects or they can go on surveillance missions. 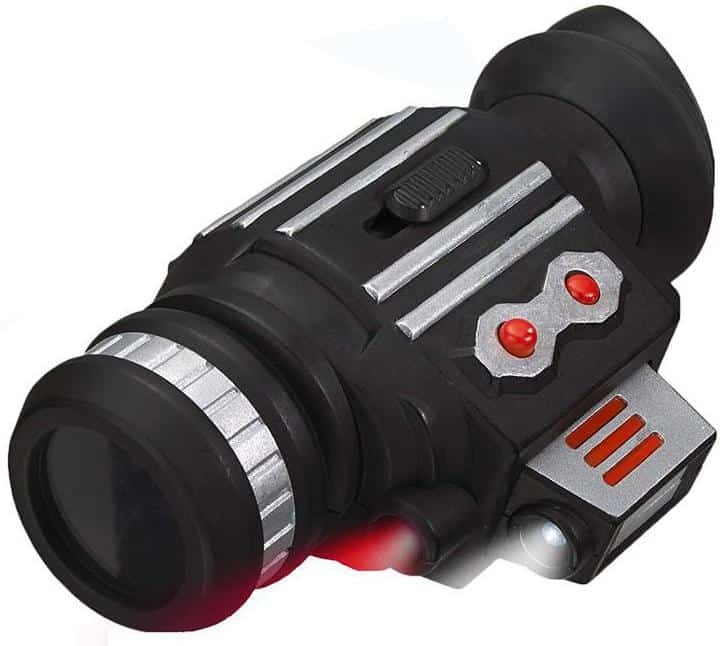 Based on infrared technology, the binocular can also be considered for nighttime surveillance which is known to come with its own challenges in the spying world. Why we like it: The goggles are an alternative for spies who need to see better in low light conditions, not necessarily during the night. With blue-coated lenses, the goggles are a recommended option for those seeking to see better during late evenings. They are not made with infrared technologies. But the manufacturer added 2 LED lights which keep the little spies from bumping into objects. Made with a head strap, the goggles are easy to wear. They don’t easily fall off the head. When looking at finer details, little spies can also use the 2X drop-down magnification glass which makes their task easier. With the help of a retractable scope, kids can look towards improving the way they look for clues. 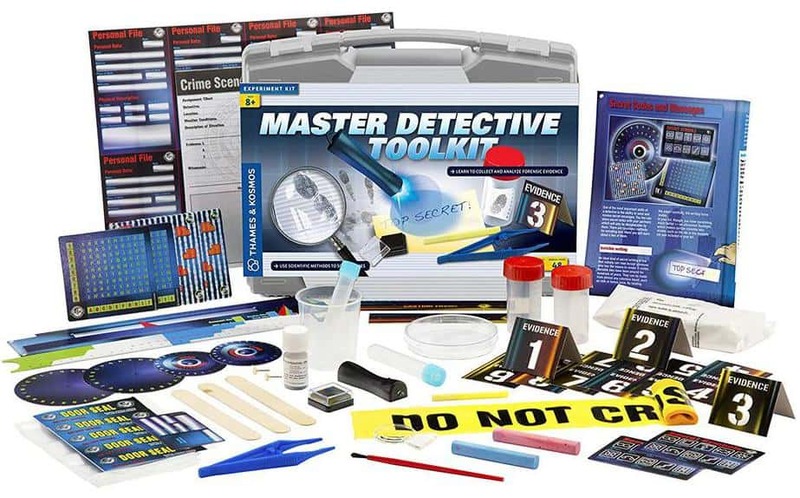 Why we like it: This great detective kit can answer all the questions kids have about the spying world. Packed as a toolkit, this started detective solution is great for kids just learning about this secret world. There is a 48-page manual they can go through to learn more about detectives. Answering all their possible questions, kids have the ability to find their way across the secret world of spying. Included experiments make the journey even more interesting. Inside the kit, kids also find essential gear for their spy experiments. These tools include invisible pens, fingerprint powder, a magnifying glass, and many other tools. Together with the spy book, they can be used to learn the basics of spying gear. Why we like it: The kit can track movement up to 75 feet away and it is used for surveillance purposes. Aspiring spies can make the most of the Spy Tracker’s design. Made to detect all types of movement, the kit is perfect for those seeking to keep a room or a perimeter safe. The kit comes with one alarm base and two transmitters. With easy setup, it is one of the most practical alarm kits out there. It manages to set the transmitters to signal visual or audio alarms whenever an intruder is detected at an impressive distance of up to 75 feet. Why we like it: This unique toy can be one of the few solutions kids can use to keep their coins safe and out of harm’s way. Coins need to be stored safely by every spy. They can be used to purchase more spy gear. This is why SpyX has developed the Secret Coin Safe which is used to keep all coins safe. The little spies can know the amount they have in the safe at all times with the help of the included digital display. But the safe is secure for a purpose. It can’t be opened easily. Actually, it has a secret button which opens up access to the coins. But not everybody knows where this button actually is. Why we like it: This impressive spy watch comes with many functions and it even includes spy paper for secret codes. 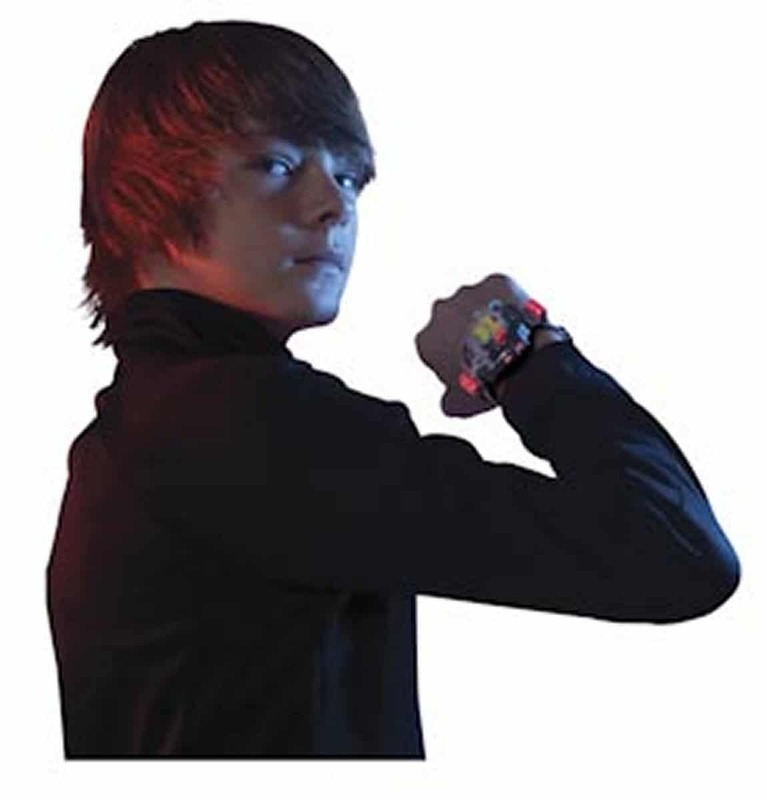 Made with an appealing design, the spy watch is among the interesting wearable tech kids can choose. 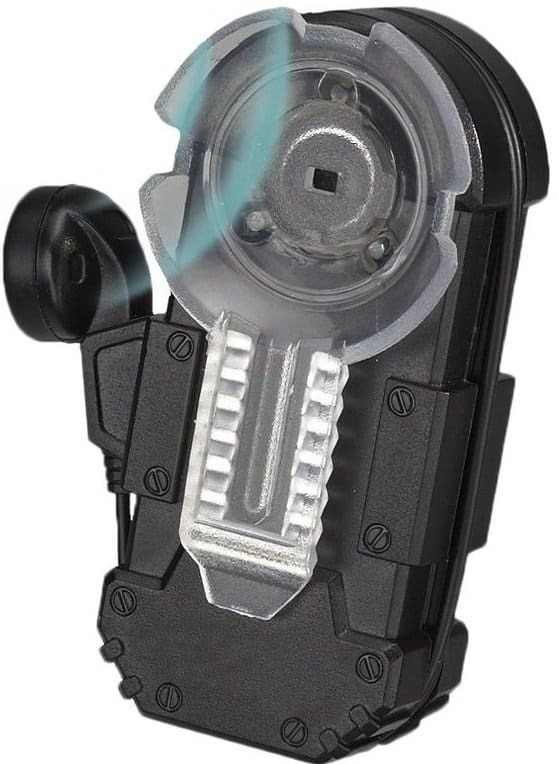 It comes with functions such as a flashlight or message capsules. Kids can even find spy paper to write their secret codes on in the watch. With 8 included functions, the spy watch comes with an included QR code. This code needs to be scanned with a smartphone to reveal even more secrets about the spy gear toy. Why we like it: This conversation amplifier is one of the top tools spies can consider listening to important discussions. Made with a compact design, the Micro Listener is one of the top tools to enhance audio volume when listening on conversations. The good news is that the listener is quite compact and that it represents a solution which is easy to work with even for multiple hours per day. A receiver is also part of the pack. It actually needs to be pointed in the direction of the conversation in order to pick up the signal and audio. With ear bud listeners, the spies always know what people are talking about. Why we like it: This powerful monocular is a compact alternative to spy binoculars. 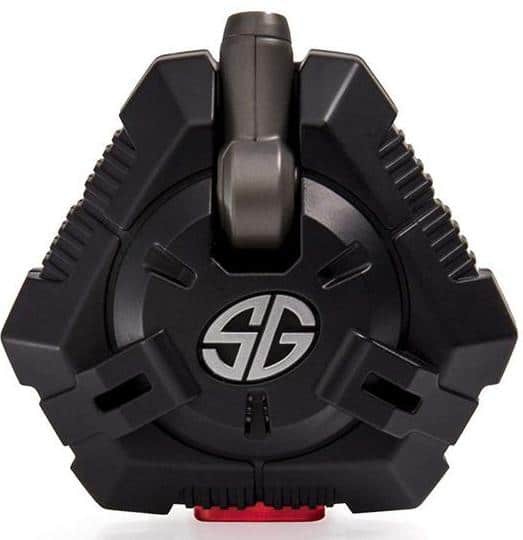 With such a compact design, the monocular can easily be carried in a pocket. Most importantly, it gives spies the freedom to track their subjects. With 4X magnification, it brings all subjects closer than they appear. In the dark, the monocular uses red or white light to improve the subject’s visibility. One of the advanced functions of the spy scope is that it allows spies to maintain a low profile. This is done by actually switching between the red and white light to blend in with the environment. Why we like it: Will spies ever learn how to cut the right wire in time? Find out with this unique group game. A bomb can be a lot to deal with for new spies. But learning how to cut the right wire might be a skill which needs to be mastered before becoming the next 007. It can take up to 15 minutes to find the right solution. But the good news is kids can play with up to 10 friends taking turns in finding the right strategy to shut the bomb off. Why we like it: With an interesting concept, the recorder allows spies to send short warnings to possible intruders. 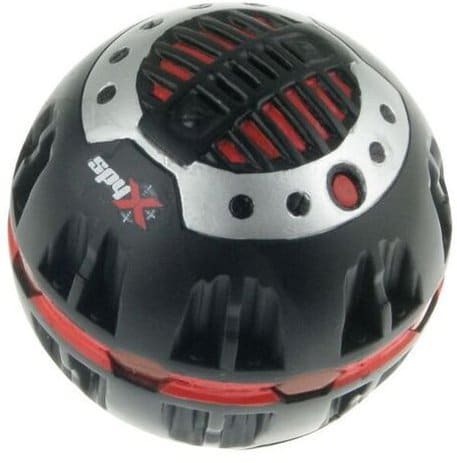 This voice recorder is a simple tool which can capture short 10-second messages. These messages are they played whenever motion is detected. Future spies can use this tool to send a warning to possible intruders. 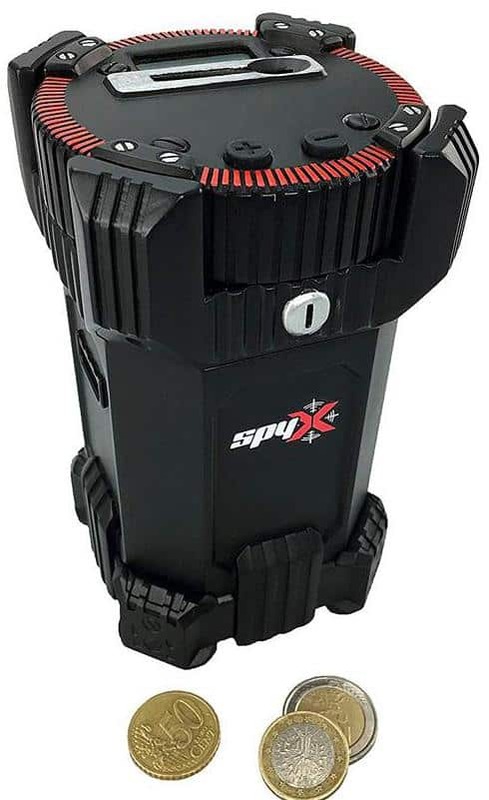 At the same time, the Voice Bomb Recorder can be used together with the safety system from SpyX such as the Lazer Trap Alarm to guard valuables. Why we like it: All spies need to have a sharp mind and be able to break codes in minutes. The strategy game is perfect for this purpose. Made using different logic principles, the code game is perfect to make kids think. It uses different principles such as deductibles to solve up to 2.000 pre-installed codes to break. All spies need to be able to crack these codes as soon as possible to save their missions. 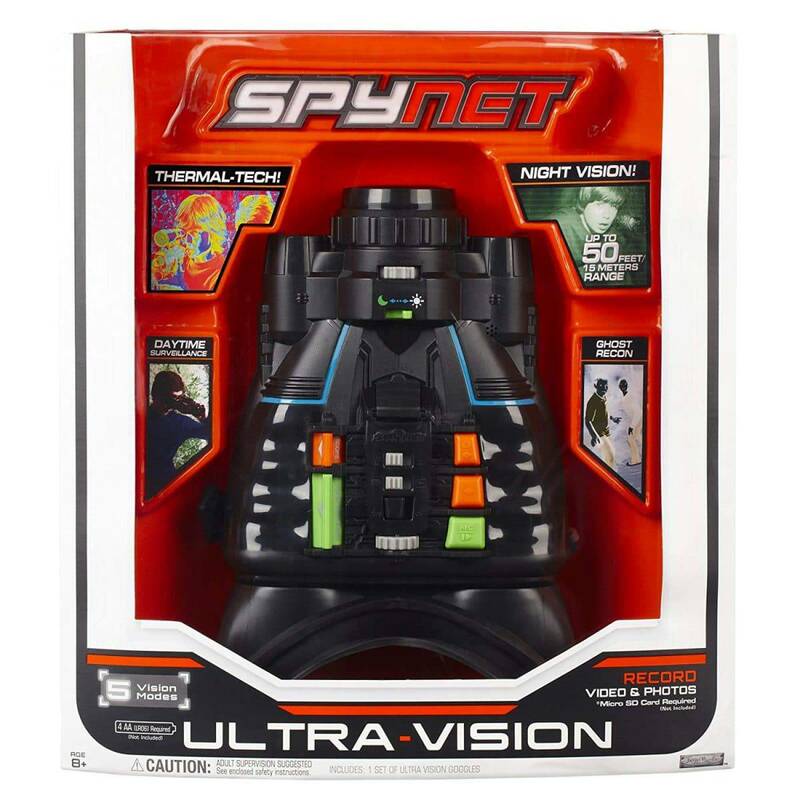 Finding the best spy gear toys for kids can be challenging. In reality, spies have a large set of skills which they can use depending on their case. From surveillance to dealing with handcuffs, there are plenty of skills to be mastered. But many of these toys can actually be enjoyed with friends. Apart from the social aspect, this type of playing actually makes spy games more fun and it may even push the little spies towards perfecting their skills. The good news is that the toys are available for kids of all ages.